Austin-Smith:Lord, acting on behalf of Irvine Bay Regeneration Company and North Ayrshire Council have revealed a public realm strategy designed to enhance the appeal of the North Ayrshire town. Improvements to Countess Street will improve the kerb appeal of an important thoroughfare connecting the railway station with the retail core and seafront, enhancing the environment around the town hall in the process. Recently reopened following a £3.7m redevelopment, the town hall will be placed at the heart of the public realm strategy as a venue for civic events. To achieve this current paving and lighting will be upgraded with layout changes being made to accommodate increased footfall. 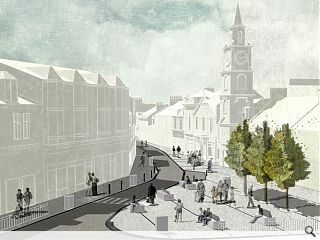 Councillor Jim Montgomerie, cabinet member for place, said: “These public realm works mark another major milestone in a vitally-important regeneration project for the town of Saltcoats. The work is expected to conclude by spring 2017.